Inside: Ever feel guilty for not making your bed? 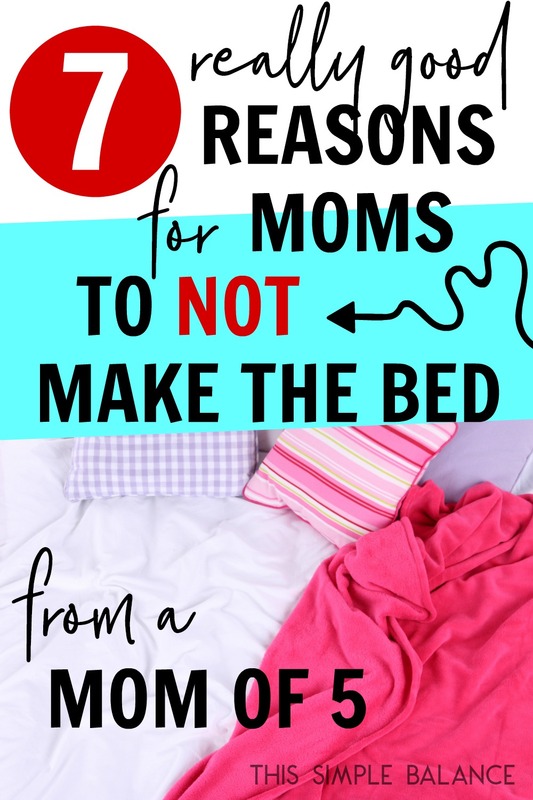 Here’s why I (mom of 5) DON’T make my bed, completely guilt-free. Bed making. Another recipe for success proclaimed by so many moms! While I love the idea of keystone habits, making my bed is not one of mine. I’m almost 100% sure it’s not going to be. But I try to never say never. If you begin your day with making your bed, all will go well with you. Or so they say. 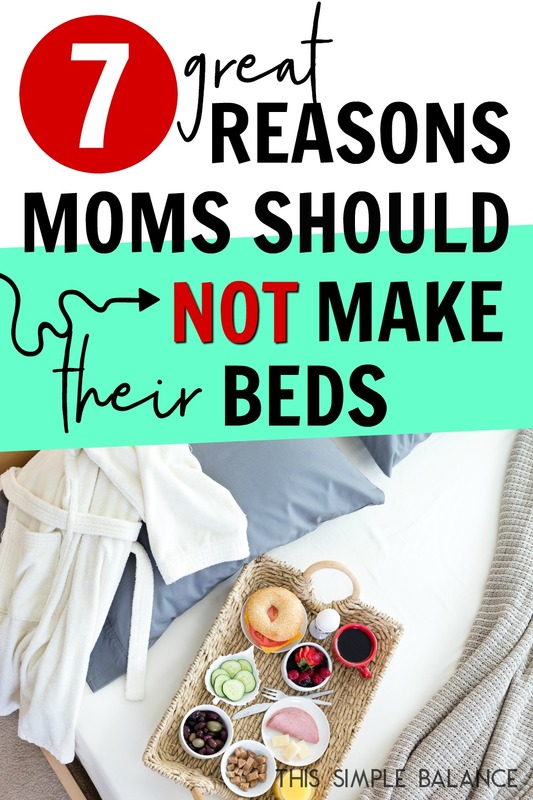 Just like those who encourage us to get up early, the moms sharing the make-your-bed advice are amazing women who genuinely want to help other moms by sharing something that makes their days a hundred times better! But for those of us who are recovering rule-followers, it can have the opposite effect. What are meant to be helpful suggestions only add to our load and our guilt. I think we can all agree that what moms need less of is guilt. My intent in writing this post is to lighten the load and help alleviate the guilt. Be encouraged that someone else has politely passed on this particular piece of advice. 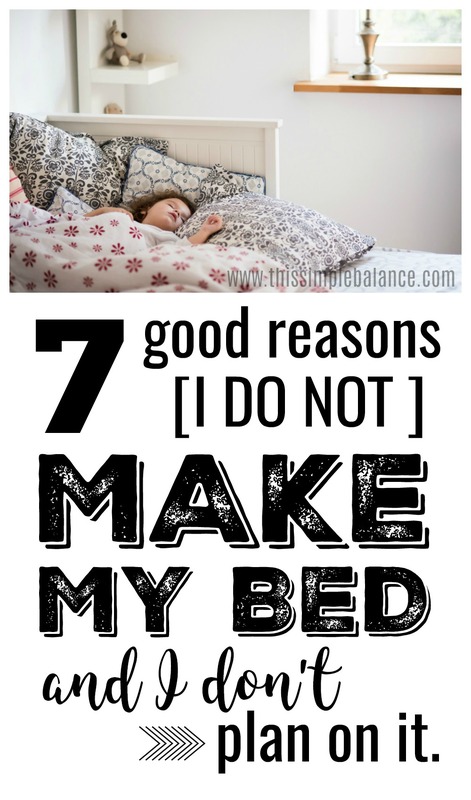 I don’t make my bed, and here are seven good reasons why. 1) I’ve got four kids aged 7 and under, and I homeschool. Priorities, people. There are so many other things I can (and must) do with my day. After taking Rosemarie Groner’s 90-day Budget Challenge, the dishes and the laundry have become my top priority. They help us stick to our budget and keep the world going round in our house. Since I quit using cleaning schedules, all other cleaning tasks are down the priority totem pole. Making beds? Ain’t nobody got time for that. 2) Making your bed creates a breeding ground for dust mites. Who knew?! One more reason not to feel guilty about not making your bed. In fact, you can pat yourself on the back when you don’t. Even better. 3) I spend almost no time in my bedroom with the lights on. The majority of my time as a homeschool mom is spent in every other part of the house. Also, our youngest still sleeps in our room, so the lights are out from his bedtime on. I probably spend more time in the kid’s bedrooms than my own. Any time in my own room is spent putting laundry away or tidying up the floor. Since I don’t spend much time there, an unmade bed really doesn’t bother me. 4) Fort building and “comfy mountains”. All. Day. Long. My kids love building forts and “comfy mountains”. I’ve contemplated buying them one of those adorable teepees, but I’m pretty sure it would be wasted money. Our third child in particular adores building forts with couch cushions and refuses to see anything else as a legitimate fort. I fought it for a long time, but I’ve since decided it’s wasted effort. After all, isn’t fort building part of an enchanted childhood? I’m resigned to there being no available seating in my house for the next five years. But the next couch? Attached cushions, absolutely no question. Continue setting a boundary over and over again, to the point of frustration. Get angry at them whenever they forgot and did it anyway. Let it go because it doesn’t really matter. Is a made bed too important to you? A friend once confided in me that her mom never allowed her to climb onto her pristine, freshly made bed. Any wrinkle she made caused frustration and harsh words. She longed to curl up there and chat with her mother, but the perfectly made bed felt more important than she was. I decided I didn’t want to be that mom. 5) My kids have bunk beds. I might be slightly more motivated to make my bed if it as to provide an example for my kids and/or teach them how to make theirs. But they all have bunk beds. Have you tried making a bunk bed? There is pretty much no way a kid can learn to make their bunk bed in a way that looks pretty. And if it doesn’t look pretty, then what’s the point? And guess what: I don’t remember teaching them to make the bed, but sometimes they do it just because they want to! Go figure! 6) It doesn’t bring me joy. A freshly made bed used to bring me joy. Now, it just doesn’t. It could be for lack of all the pretty pillows and duvet covers, but cash flow problems and minimalism stop me from buying those. The truth? I spend so much time doing so many other things that don’t necessarily bring me joy (changing dirty diapers, anyone?). This is one less thing I “have to” do. 7) I just don’t care. I’m A-type and a Myer’s Brigg’s “J”. I care about so much more than I have the time and energy to actually accomplish. When I come across something I really don’t care about doing, I really really need to seriously consider not doing it. I’ve spent years and years doing things just because someone said I should. If that’s you, start examining the things in your life you don’t love spending time on. Why are you doing them? Do you really need to or are you just following an arbitrary rule? If you can find no other reason than because you “should”, it’s time to decide whether that task is the best use of your time. Love to make your bed? Then by all means, keep doing it! On the other hand, do you really not care about making your bed, not even a little? 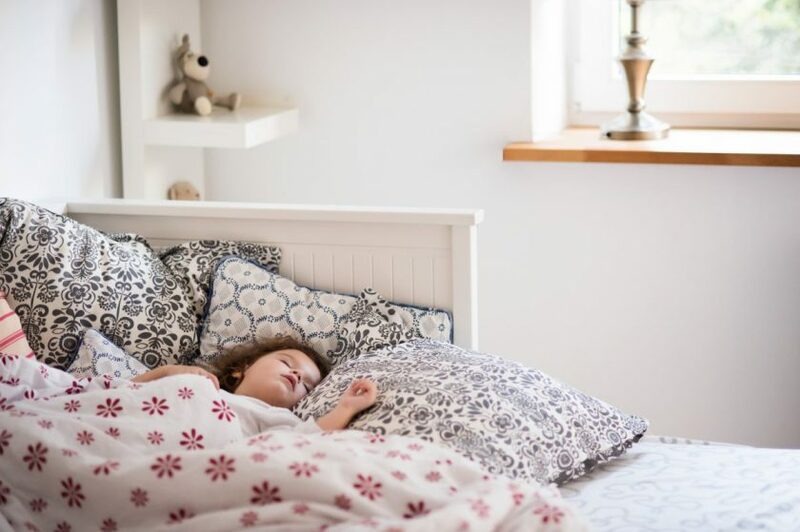 You are not alone: this mom stopped making the bed and refuses to feel guilty (not even a little). Want to stop making your bed? Permission granted. My husband works nights on and off all year round. I could get 4 months of him on days and then 9 months of him on nights or vice versa. Therefore my bed rarely gets made. Just when I get into the habit of making it he switches to nights. So this makes me feel a lot better about the fact that i almost never get to make my bed. I used to feel guilty especially when he was on days. I definitely feel more comfortable in my unmade bed and its nice to come in when he isnt here and know exactly where he slept and to snuggle into his spot. Oh man, I am dying here!! Tucking in your dust mites! ? This made me feel SO much better about not making our beds…like EVER! Thanks for sharing! you’re so welcome! We can all use a little less mom guilt, am I right? Absolutely! Do what works for you. I’ve always felt like I should A) get up early and B) immediately make my bed, neither of which has ever been helpful to me. I’m not going to spend energy trying to fit into other people’s shoulds! Such an encouragement.